So as we all know, the weather has been pretty crazy lately. A couple weeks ago, we had the single-digit weather. Today I'm taking full advantage of the 60-degree weather and wearing my new dress in bare legs. I've always admired the iconic Diane Von Furstenberg wrap dress but I know I can't afford one. Hence, I am always on the lookout for similar (and affordable) versions. Jean tweeted about this dress a while a back and it was truly love at first sight for me. Unfortunately, small sizes are long gone online and it was nowhere to be found in stores. I basically gave up looking for it. Imagine my excitement when I got a text from the thoughtful Jean letting me know that she found the dress but it didn't work out for her. A few days later, the dress showed up at my door. I couldn't help but wear it the very next day. The print is absolutely stunning in person. This is my third wrap dress from Old Navy/Gap and by far, my most favorite one. OMG, that orange dress is so pretty, Sydney! You sure look 'springy'!! I love this dress on you!! Such a pretty color and i adore the print. You look great. Pretty dress! Like the pop of green with the necklace. Nice look. That dress looks so pretty on you! Love it!! That's so sweet of Jean. You look fabulous! great dress hon :) i love the print and the color it looks fabulous paired w/ the kelly green necklace! How lovely of Jean to gift this to you! 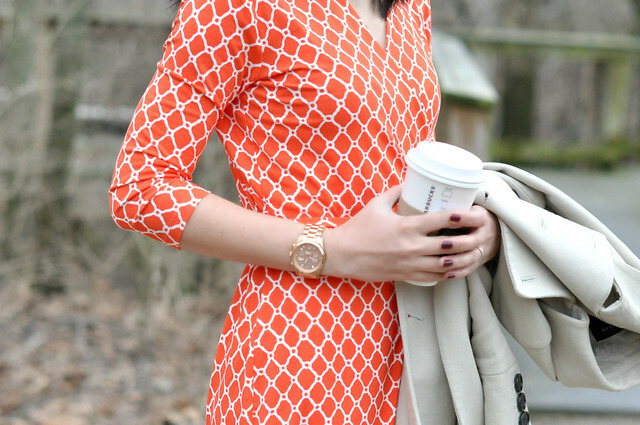 I love the color and pattern, and great choice on the green necklace, very complementary to the orange. Yay for 3 times a charm! Really a lovely dress! I think I might take a trip to Gap and check them out.